of these beautiful semi-precious stone Rosaries by Creed today for yourself, or as a gift for someone special. Sales of $50.00 or More! A thorough, 95 page 4" x 6" booklet on the Holy Rosary. 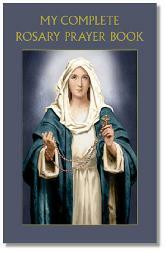 It provides complete instructions on how to pray the Rosary and includes all of the prayers and mysteries. In addition, it includes scipture passages and a meditation passage for each mystery, covers Catholic Novenas and many other subjects concerning the Rosary through history up to our current day. Beautiful color illustrations. 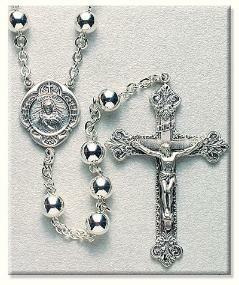 Free with all sales of Rosaries priced $50.00 or more, including bracelets and chaplets. Beautiful Rosary with genuine rose quartz beads. Features a center of Our Lady with an ornate crucifix. The links, center, and crucifix of this rosary are all gold over sterling silver. Hand made in Italy. Comes with a nice case and a certificate of authenticity. Personalize your Rosary with a brief inscription on the back. Engraving makes every item a lasting and memorable gift. Instructions: 1) Enter the inscription in the Inscription field above. 2) Click the "Order Now" button. That's it! This service is only available for Rosaries ordered from this page. Please allow 1 additional day for engraving. 6MM Beads, Crucifix 2", Total Length 18.5"
Included as a Free Gift. Beautiful, 6mm All Sterling Silver Rosary. 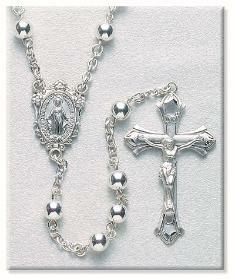 All components are made of sterling silver, including Crucifix, Miraculous Medal Center, beads, chain, clasp and pins. A wonderful gift that's sure to become a family heirloom. Crucifix back suitable for engraving. Comes with deluxe velour box. 7MM Beads, Crucifix 2", Total Length 19.25"
Stunning 7mm bead All Sterling Silver Rosary. Every part of this Rosary is crafted from Sterling Silver, including Crucifix, Sacred Heart Center, Chain, beads, pins and clasps. A wonderful gift that is sure to be passed down in your family. Crucifix back is engravable. Comes with deluxe velour box. - Price Above is for Complete Rosary. 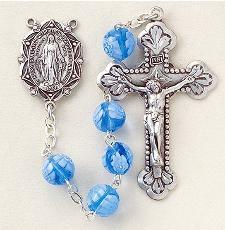 Stunning 8mm light blue Venetian Glass Beads with Sterling Silver center and Crucifix make this Rosary a wonderful gift. Each unique glass bead has white flower designs inside. Miraculous Medal center. Comes in deluxe gift box.